ROUTE: Short walk. Start Sharpitor Car Park. Finish Sharpitor Car Park. Distance 10km. PUBLIC TRANSPORT: Walk originally based on the discontinued Transmoor Bus Service. Probably now possible starting from Plymouth to Yelverton or starting from Tavistock. NOTE: This walk never ventures too far from Sharpitor car park so it is easy to cut the walk short if you run short of time. This walk was planned using a GPS device with the GPS waypoints of the numerous small stone rows and sites in the vicinity of Sharpitor. The route and these sites are included in the map below. It is a slightly odd route as it attempts to include as many of these sites as possible - the route can of course be adapted! 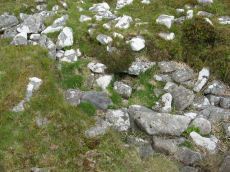 Some of these stone rows are very diminutive and will probably be easier to find in the spring, or winter if you are going by car, when vegetation has not yet covered them. If this walk is done using the transmoor bus then it is definitely worth making sure there is sufficient time to fit in the Hart Tor rows. If need be skip some of the lesser rows. Alternatively reverse the direction of the walk so that these are seen early on. To do this follow the Devonport Leat north from the Stanlake plantation. 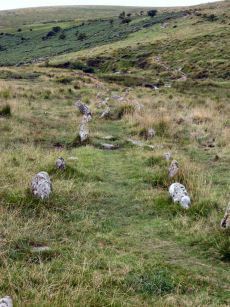 The Hart Tor rows ascend the slope from the river Meavy. Take care finding a route down by the Aqueduct - the hillside is strewn with boulders. This route starts at Sharpitor car park. Cross the road and head south west for 250m to the Sharpitor (N) or Peek Hill cist. 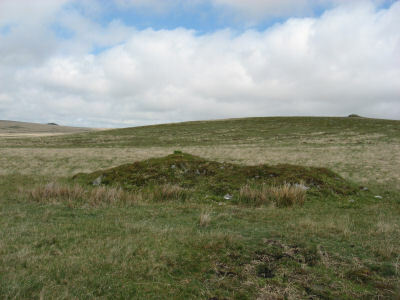 Sharpitor rises steeply to the east of the cist as can be seen in the photo below. 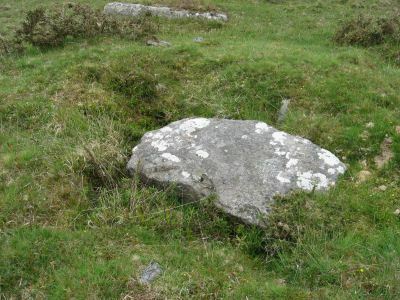 This is a fine example of a cist with a surrounding cairn circle. Proceed for another 100m in the same direction to the Sharpitor NW stone rows. These are separated by a short distance; one is double and the other single. These rows can be hard to see as the stones are very small. Now head almost due west across the road on for nearly half a kilometre to the Sharpitor West stone row and cairn. This again is a small monument discovered around 1962. There is a nice view with Tavistock in the distance. From here walk around one kilometre to the north east almost sticking to the contour of the hill. Down hill about half a kilometre away is the dismantled railway and at points along this section of the walk and later at Ingra Tor you will be able to see the track and some of the associated bridges. The railway serviced the quarries at Foggintor and went from Princetown, hugging the contours around King's Tor and snaking round to Dousland and on to Yelverton. 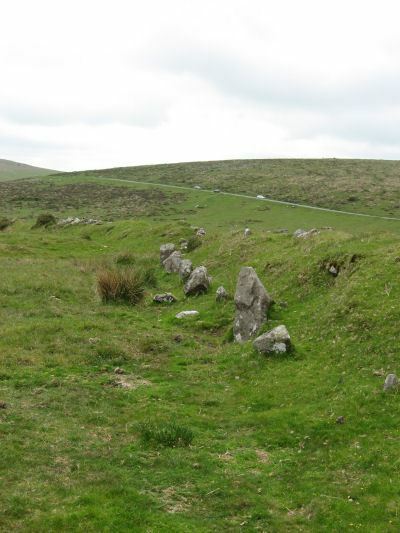 The Merrivale Complex walk follows the old rail route out of Princetown round to Foggintor. There are also some sections of the track that make for a nice route to walk near Burrator reservoir. The photograph below was taken by Robert Burnard of the Dartmoor Exploration Committee on the 14th March 1891 near Dousland not far from the present day Burrator reservoir. The train was a freight train but had six passengers on board who had to take refuge in a near by farmhouse. 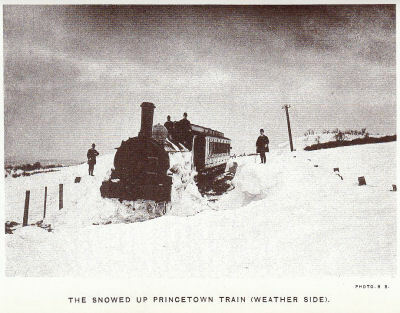 The train had left Princetown on the 9th March and eventually got through to Yelverton on the 17th March. Our walk now ascends a section of Leeden Tor. The standing stone maybe prehistoric but it is very hard to say as there are also other stones in the vicinity which appear to be boundary stones. There is also a 3 km section of reeve, a prehistoric field boundary, which stretches back up over Sharpitor and on to Peek hill to the SW and runs almost parallel to the route of the road. This reeve is marked as a boundary work on the OS map. 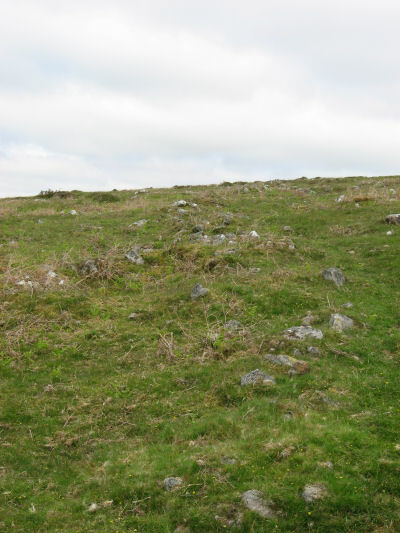 It climbs on up and over Leeden Tor and can be seen as a grassed over low rubble bank as in the photo below. 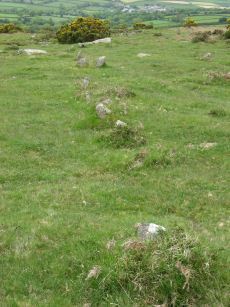 We head now a little to the east for the Leeden Tor stone row. This row is again made up of small stones, it is slightly unusual in that it rather steeply ascends the hill. Down below is the road. 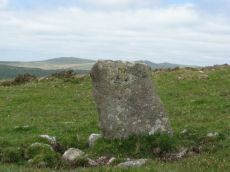 For a shorter walk head down to the road and cut across to head up to the Black Tor stone row. 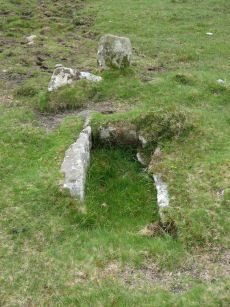 If you have time continue up to the north west to the top of Leeden Tor and onwards to find the Ingra Tor cist. The cairn is quite pronounced and the cist has a large capstone. From here the dismantled railtrack is very close by. 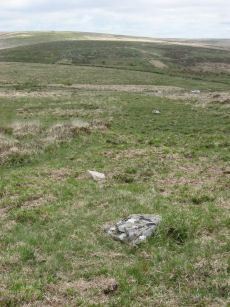 An alternative route would be to join that and follow it as it weaves around the contours up to Princetown. 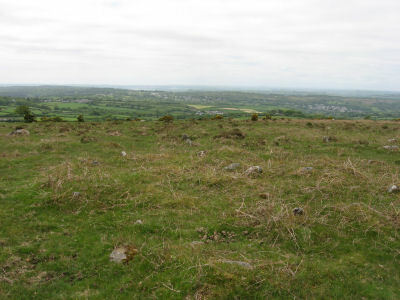 There are substantial prehistoric settlements along that route at Walkhampton and Yes Tor Bottom and also to the west of Ingra Tor are the enclosed settlements at Routrundle (as marked on the map above). However, on this route we will head due east for half a kilometre and find a suitable place to cross the stream and then head south-eastwards for the Black Tor stone row. This row has had the curious fate of having been incorporated into a field wall at Stan Lake. As can be seen in the photo below the row diverges at a very narrow angle from the bank of the wall. 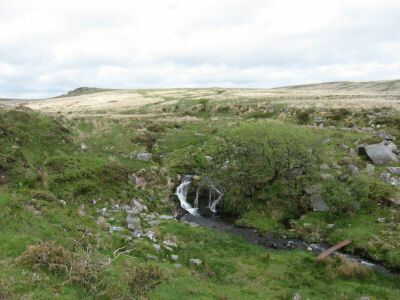 From the Black Tor row head downhill to the Devonport Leat and the River Meavy. We cross these and head east following the aqueduct steeply uphill. There is a lot of clitter that needs to be clambered over on this hillside so take care on this stretch of the walk. 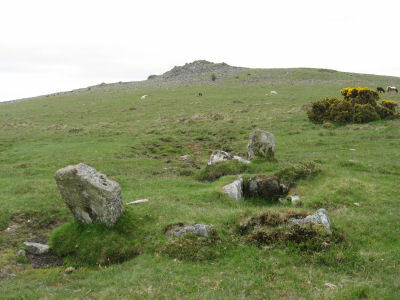 For an alternative you could instead follow the Meavy North to approach the Hart Tor stone rows from the south west as they ascend the hill from the Meavy - simply double back for the return journey. The Raddick Hill cist is about half a kilometre east from the aqueduct. 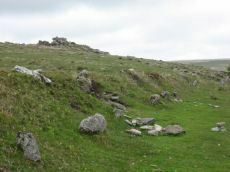 Head slightly east of north towards Hart Tor and find a suitable place to cross the stream and find the cairns at the uphill end of the Hart Tor rows. This is a fascinating site when documented by Wilkinson in 1859 the double row was "terminated by a large monolith, now fallen, measuring about 25 feet long by 2 feet and 3 inches". The return journey follows the River Meavy and then the Devonport Leat up to the Stanlake plantation. Skirt around the forest and head back to Sharpitor car park.